【High Versatility】- This all-round tripod works seamlessly with DSLR/Compact Cameras/SLR/Mirrorless Camera Tripod/Camcorders + all GoPro Hero 5/4/3+/3/ Session (GoPro adapters Included) + iPhone/Android Smart phones. 【Flexible Legs】- You can wrap it anywhere you can think of, like lampposts, fence posts, tree limbs, chairs, doorknobs etc for superior perspectives. 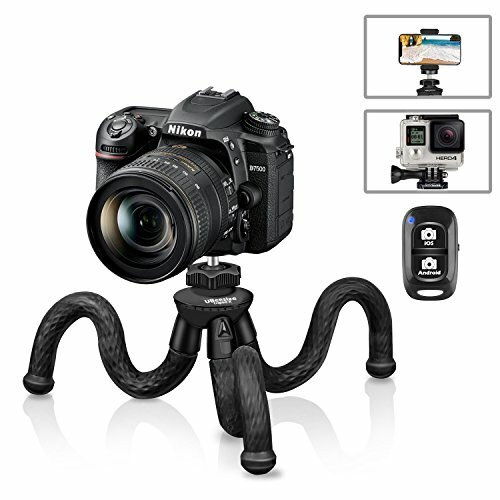 This tripod stand makes capturing sharp photos easy and quick, perfect for vlogger on the go! 【Travel Ready】- Weighing a mere 8 ounce and maximum length of just 12", the tripod stand is so compact with its sturdy and lightweight design, it makes your trustworthy travel buddy wherever you go. Toss it into your backpack, purse or handbag and get going! 【Ultra Sturdy and Waterproof】- Strong OCTOPUS legs are made of premium steel with a high density TPE and rubber coating for peerless durability. While waterproof feature improves outdoor experience as you can now set it in the water! 【What You Get】- 1x Flexible Mini Tripod; 1x Phone Grip Mount; 1x GoPro Adapter; 1x Smartphone Remote Shutter; 1x Orientation Adapter; UBeesize Lifetime Warranty and 24-hour friendly customer service.